Years of being a hockey fan (and coaching a bit of it) provoked me more and more toward tenacity. It also incorporated the word “snarly” into my vocabulary. A decade later I took those same words to another retailing company. The words were important. They expressed and evoked emotions that I thought were urgent and important. My mind hasn’t changed. All that verbiage points to some of the most necessary ingredients for business success – or higher business success. Name the problem and I’ll make application. HR? Sales? Profits? Operational inefficiencies? Cultural issues? Employee engagement? Leadership transition? Whatever? The higher the tenacity, the higher the performance. It’s not the same as resilience. Tenacity is an offensive weapon. Resilience is defensive. As for snarly-ness, it’s driven by the passion and need to succeed. The strong desire to win and kick the teeth down the throat of anybody or anything that would hinder victory. All that language reeks of action. It’s a lot of doing. Doing that starts in your head because the main battle ground for all this is in between our ears. I intentionally phrased that mission statement with that beginning…”to become…” It’s something we could start today. It’s something we’d never be able to walk away from, saying we had completed it. That’s the deal. That sums it up best for me. So let’s wrestle this down and make some applications. I want to go from the outside in because of all the noise out there. I know it’s noisy in your head, but that little 4″ screen in your hand, and all the other screens in your life produce an avalanche of noise unlike anything we’ve seen before. The net floods us with data, information and opinion that is often indiscernible from reality and truth. Do this. Do that. Don’t do this. Don’t do that. Follow these 4 steps. No, follow just these 2 steps. Go left. Go right. It’s black. No, it’s white. Your relentless pursuit of tenacity and snarly-ness starts with shutting up and shutting down all the crap entering your world. Now before you think I’m suggesting you not listen to people, let me clarify. I’m on the phone with a friend and we’re talking about a variety of things, both business and personal. I reiterate something I’ve believed and tried to practice for a very long time. It has to do with selling. And building meaningful relationships. It’s a sequence that begins with us getting acquainted with somebody. We migrate from being strangers or unknowns to each other to where we know something of each other. You know my name and a bit about me. I know your name and a bit about you. Next, we have to move toward safety. That is, you have to feel safe around me. I have to feel safe around you. If we can’t get to that spot, the relationship or connection won’t happen. There are plenty of people in your life who are known to you, but you don’t feel safe around them. You know their name. They know your name. No matter, you feel ill at ease for some reason. Maybe it’s because you feel they’ve got some hidden (or not so hidden) agenda. Maybe it’s because their personality bristles you and makes you uncomfortable. Maybe it’s because your communication styles are so opposite you just can’t relate. For some reason, we have all these known people in our lives who bring us no value because we just can’t get to a safe place with them. Keep in mind — and think of all the people in your life who aren’t known by you — but you feel safe with them. Authors, speakers, experts…they all fall into that category. You know them, but they may not know you. Because they crank out content that you enjoy, or that helps you, you’ve become acquainted with them. You feel safe with having them “speak” to you in whatever way they do that (books, speeches, blog posts, videos, webinars, podcasts, etc.). Okay, so far so good. Or is it. Experts are nice, but who is really an expert. And who do you listen to? Who should you listen to? Why should you listen to them? Those are GINORMOUS questions that have big and varied answers. No, I’m not going to try to answer them here, except to give you some things to consider and think about. YOU have to decide for yourself. You’ll hear that theme throughout today’s show because it’s at the heart of tenacity and snarly-ness. 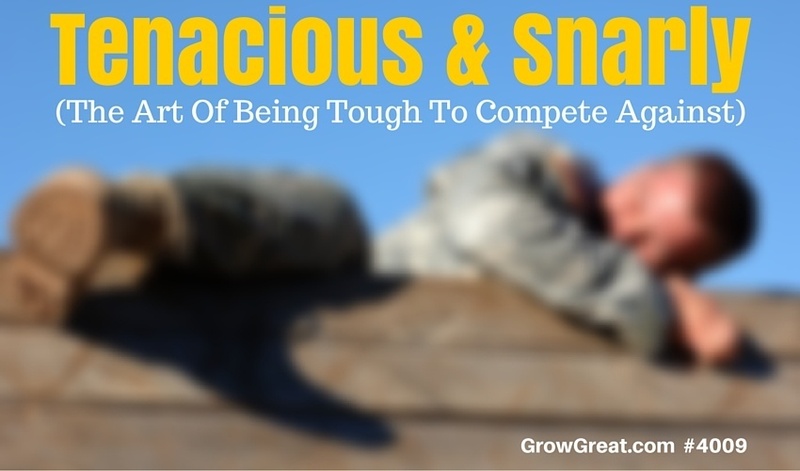 This is YOUR tenacity and snarly-ness we’re talking about so you have to own it. It’s got nothing to do with me or anybody else. It’s all you! The distraction of the Internet ruins tenacity and snarly-ness because for every expert who says go right, others say go left. For every guru who wears French cuffs and $3000 custom made suits there are other gurus who wear jeans and a hoodie. There are gurus and experts who use Uber exclusively and others who drive Bentleys. How can you listen to them all? You can’t. Well, you can listen, but your mind will be trashed trying to figure out a path with all these incongruent messages coming at you. “I’m my own man,” says the guy in the corner office. I’ve heard that before. Quickly I’ve come to learn the corner office guy or gal has demons in their head just like everybody else. Sometimes more so. The stakes are higher. So is the pressure. Beware the man or woman who declares, “I decide for myself.” They’re listening to something or somebody. Sometimes they’re as confused as anybody about all the voices of advice entering their brain. This is where it turns inward. This is where your world view and your view of yourself matters. When I was a teenager I went through a phase, like most teens, where I got really tired of being worried about what people thought. My teen angst wasn’t rebellious toward behavior though. Mine was a drive against vanity and status. I was sick of seeing people think somebody was better because they had cool clothes or cool cars, or lived in the cool neighborhood. I just didn’t care. It wasn’t a judgmental thing for me. It was purely a substance over style thing for me. I had nice, even cool clothes. I had a cool car, too. But I was blessed. One word summed it up for me during my teen years: pretense. I hated pretense. Still do. I’m also a zig zag guy. When everybody is zigging or people want me to zig…I gravitate toward zagging. Just because. Freud would likely have a field day with me (and you, too, huh?). Lose weight. Get cosmetic surgery to fix that nose. You introverts, become extroverts. Blah, blah, blah. Here’s what the world is telling us – be something you aren’t. Fix yourself. Sure, lose weight if you must to improve your health. Growing great is all about improving so we can be the best version of ourselves. Emphasis is on being ourselves though. Embrace who you really are and go all in on it. It’s crazy hard because we see people who are nothing like us and admire them so. The introvert looks longingly at the gregarious fellow holding forth in the group and wishes he could be more like that. STOP IT. You’re not him. He’s not you. Get comfortable with who and what you are — and become the best version of yourself. Why is that important? Because if you’re not true to yourself you can’t be tenacious or snarly. You can’t win in the market – whether that market is your home or your office or the world at large. You just can’t win without being tough to play against. Be tenacious. Be snarly. Be tough to compete against. If the world is going to beat you down, make it tough on the world to win. Develop that habit and you’ll win a lot more than you’ll lose. It’s not about winning all the time (nobody does that), but it is about winning much of the time. People determined to grow great do that more often than not. Join us.